For me, this usually means that I get invited to a party where I care far more about the company, food, and drink than I do about the planned entertainment. Though I do enjoy throwing parties quite a lot, I usually forget about this so-called “Big Game” until the last minute, and someone else has already claimed hosting duties. This year, however, is quite another story. I am from New Orleans, you see; and right now it doesn’t matter if you’ve ever even seen a football game before, if you’re from N’Awlins, you are damned excited about this particular game. The Saints have never been to the Super Bowl before, and it would be a severe understatement to say that the city is fired up about it. How excited are we? This is how excited. Five thousand men in dresses parading down Bourbon Street can’t be wrong, and you’re sure not going to see that in Indianapolis. So, of course, I can’t let this one slide by without a celebration. But typical fare at a Super Bowl party tends towards the “bar food” end of the spectrum; me, I usually serve something a bit more soigné than, you know, hot wings. Not wanting to make my guests uncomfortable, though, I’m reluctant to serve the sort of food that I would normally turn to, things like precious canapés or anything with an adjective-laden name. I mean, who wants to watch football with a cup of chocolate mousse balanced on his knee? No, for this party, I need something that goes with beer. Of course, there will be a main entrée, but people are going to want something snacky, something that can sit out all night, something starchy and bite-sized. Chips or cocktail nuts would certainly fit the bill here; but they’re so incredibly salty. I find that football goes best with a steady infusion of beer, and if I want to be standing at the end of the night, I don’t need anything to make me want to drink more. 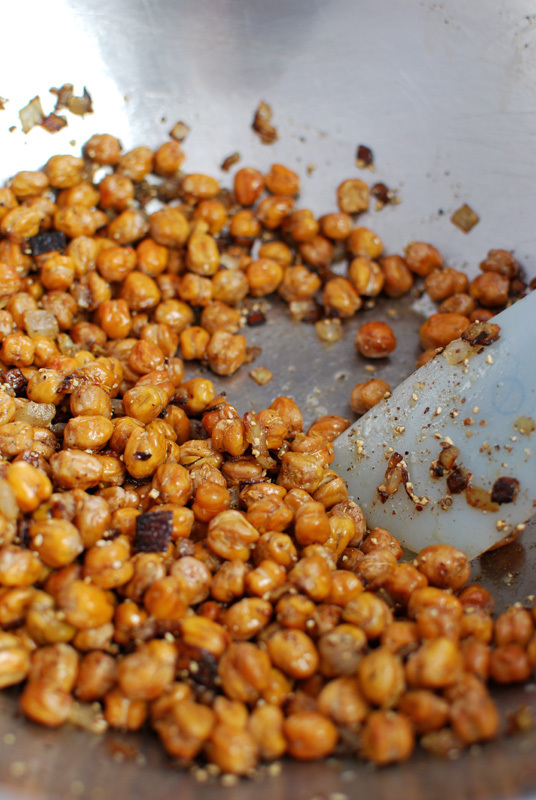 Enter the recent darling of the food blogging world: the roasted chickpea. Endlessly adaptable to any flavor you put with it, these little gems are just what I’m looking for: bite-sized, crunchy, starchy, addicting, and they can sit out for ages. Oh, and did I mention that chickpeas are incredibly cheap? Could it get any better? Of course, I could never settle on one flavor, so I’ve narrowed it down to three. I’ve chosen a range that I think will please all my guests, one way or another. The first is inspired by the flavorings of a traditional béchamel sauce, using onion, white pepper, and nutmeg. The onion is caramelized, bringing a dark sweetness, while the abundance of coarsely ground white pepper has a sharpness that cuts any stodginess. 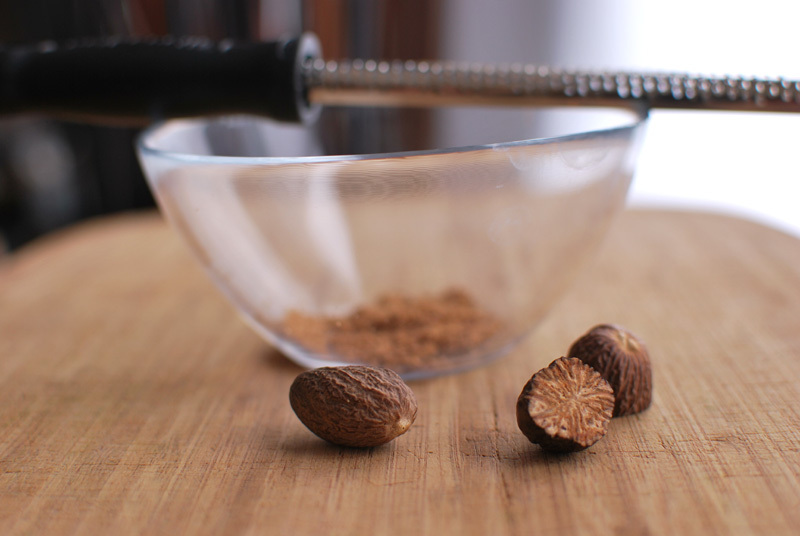 In the background, the nutmeg scents more than it flavors, with a warming and seductive spice. The second seasoning blend is a bit more familiar, a tried-and-true combination of lemon and thyme. 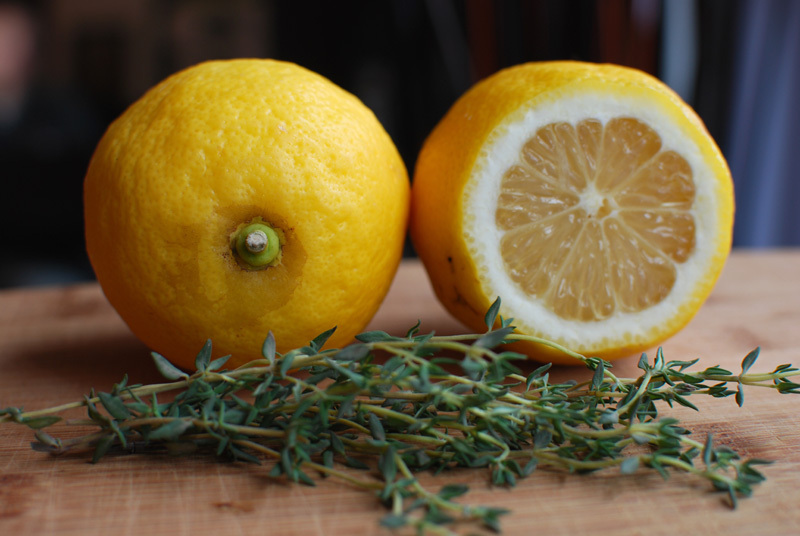 I use lemon zest for its floral qualities, which accentuates the citrus notes of the fresh thyme, while lemon juice blends with olive oil to make a sort of savory vinaigrette that soaks into the hot roasted chickpeas. A bit of black pepper adds depth, but not enough is used to bring any heat. For those who like a sweet-savory combination, the third seasoning combines smoky cumin, toasted lightly before grinding, with cayenne and hot paprika for heat, and cinnamon and brown sugar for depth and a light caramel flavor. A pinch of salt here makes the flavors pop without turning things savory. This is not the extent of my Super Bowl menu; I will talk about other foods as I’m able, but this might be early enough for you to get some use out of it for your own party. Whether or not you use these flavor combinations, you can hardly go wrong with this idea. Simple, endlessly customizable, and tasty as all get-out, roasted chickpeas are an excellent (and healthier) substitute for the typical cocktail nuts or chips that you’d otherwise be tempted to resort to. 1. Drain and thoroughly rinse 2 cans of chickpeas. Lay out in a single layer on a kitchen towel, and gently dry by hand, or let sit until dry. Preheat oven to 350º F.
2. Spread chickpeas in a single layer on a rimmed baking sheet. Roast for about 1 hour, shaking occasionally, or until crispy and lightly brown. Immediately remove from oven and toss with desired seasonings (variations follow). 1. Heat a sauté pan over medium heat. Add peppercorns, and toast until fragrant, about 3 minutes. Remove from pan, and crush in a mortar and pestle, or with the flat side of a large knife. Transfer to a large bowl. Add nutmeg. 2. Heat 2 tablespoons oil in the same pan over medium-low heat. 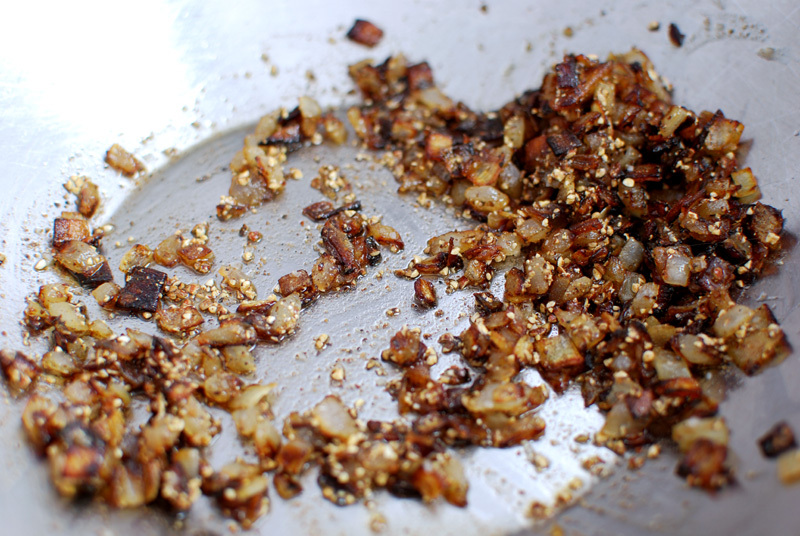 Add onion and cook, stirring often, until onion has caramelized, turning brown and soft, 15 to 20 minutes. Add to bowl with peppercorns and nutmeg. 3. 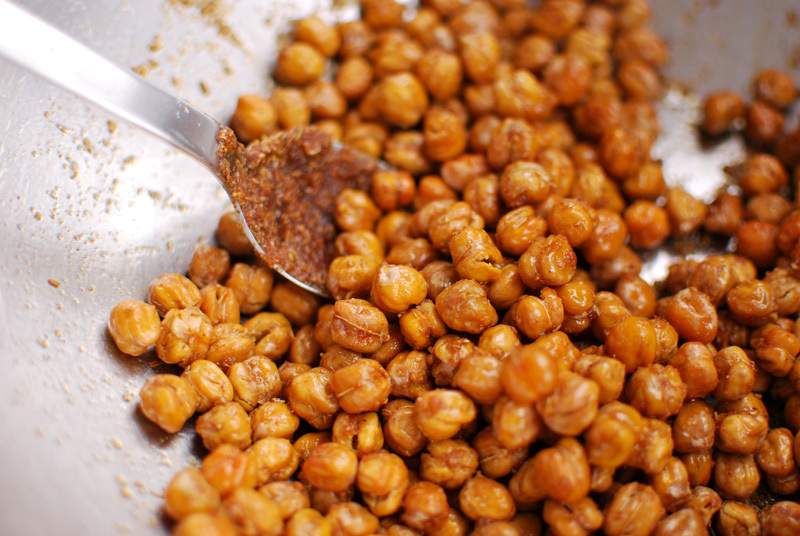 Toss hot roasted chickpeas with the mixture in the bowl, adding salt, and remaining olive oil (if needed). 1. Mix all ingredients together in a large bowl. 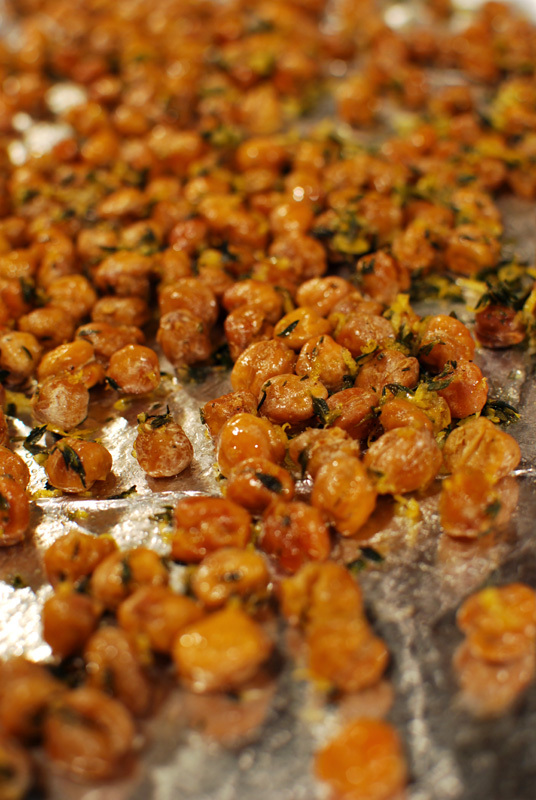 Add hot roasted chickpeas, and toss until coated. 1. Heat a sauté pan over medium heat. Add cumin seeds and toast until fragrant, about 3 minutes. 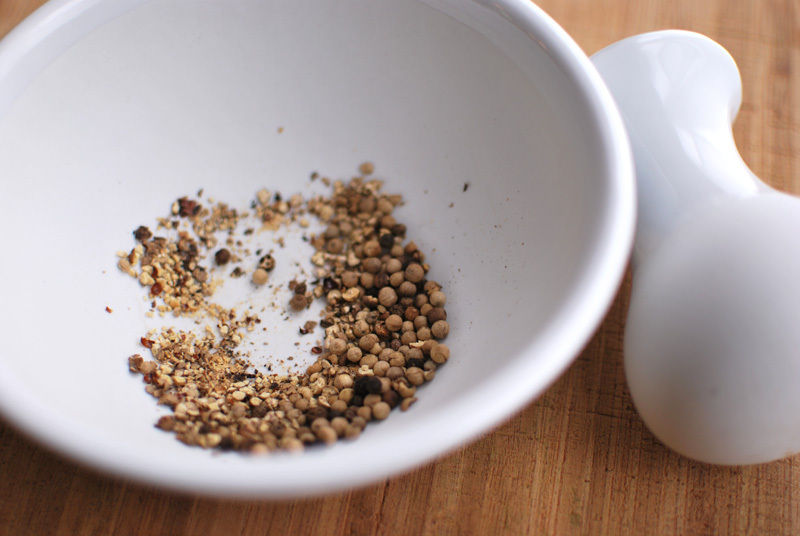 Remove from heat, and grind to desired coarseness in a mortar, or electric spice grinder. 2. 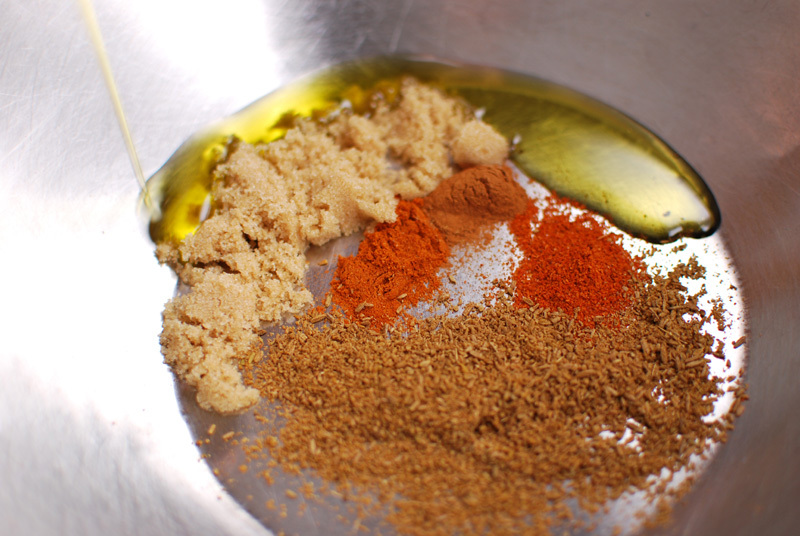 In a large bowl, mix ground toasted cumin, cayenne, paprika, cinnamon, salt, brown sugar, and olive oil. Add hot roasted chickpeas, and toss until coated. 1. 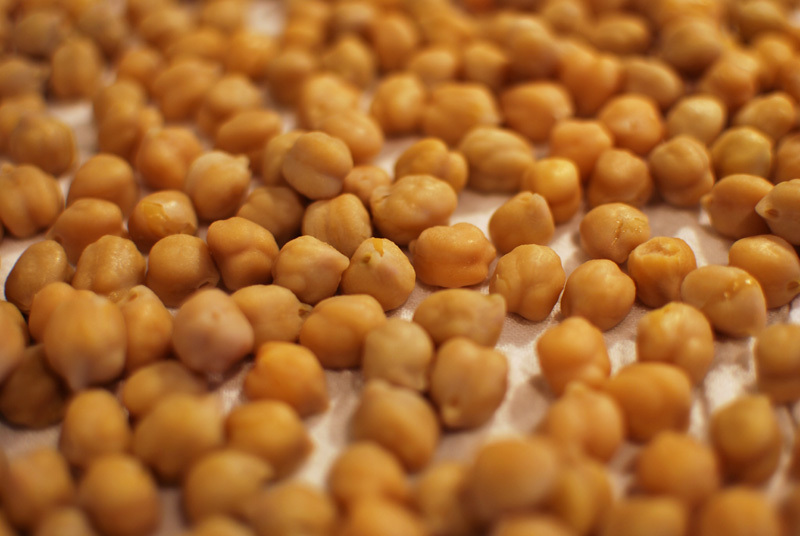 For the most part, roasted chickpeas can sit at room temperature in an airtight container for several days. (The onion-laden ones, maybe store in the refrigerator.) If they go soft, just re-crisp them in a 350º F oven for 5 to 10 minutes, or until they’re crunchy again.